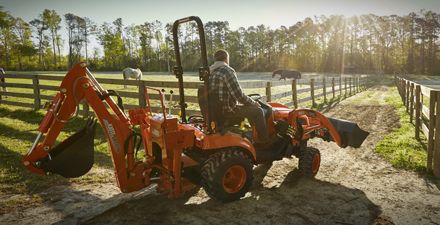 Purchase a qualifying KIOTI Tractor or KIOTI Tractor with Implement(s) Package and receive up to $7,500 in rebates. Low rate financing does not apply. Standard financing rates do apply. Cash in Lieu may be combined with Military/First Responder Discount or Canadian Grand Opening Celebration. No other retail programs can be combined. Cash in Lieu may not be combined with Free Loader or Free Mower program. Program period and conditions subject to change without notice. Contact your KIOTI Dealer for details. Disclaimer: *Offer available April 1, 2019 – June 30, 2019. Cannot be combined with any other offer. Rebates and/or financing based on the purchase of eligible equipment defined in promotional program. Pricing and rebates in CAD dollars. Additional fees including, but not limited to, taxes, freight, setup and delivery charges may apply. Financing is subject to credit approval. Customers must take delivery prior to the end of the program period. Some customers will not qualify. Some restrictions apply. Offer available on new equipment only. Prior purchases are not eligible. Offer valid only at participating Dealers. Offer subject to change without notice. See your dealer for details. *Pricing in CAD. Up to specified amounts when purchasing qualifying Tractor, Loader and Backhoe. Other rebates offers are available. See your Authorized KIOTI Tractor Dealer for more information. Enter the total loan amount to calculate your estimated monthly payment for different rates and terms available on KIOTI Tractors and UTVs. For more information on available finance options contact your Authorized KIOTI Tractor Dealer. *Amounts are reflected in currency entered. *Amounts are reflected in Canadian Dollars (CAD). Payment calculator reflects Canadian interest rates. Payment calculator does not reflect insurance, document fees or taxes. Special finance rates are for new KIOTI tractors and attachments purchased together. Finance terms are available up to 84 months on eligible equipment. 0% financing is available on specific models. Down payment may be required. Financing based on the purchase of eligible equipment defined in promotional program. Offers cannot be combined. Financing is subject to credit approval. Some customers will not qualify. Restrictions may apply. Offer available on new equipment only. Prior purchases are not eligible. Offer valid only at participating Dealers. See your dealer for details.